Who doesn’t like a good map? For as long as I can remember, maps have always held a special fascination for me. Atlases, globes and wall sized posters were a staple of my childhood as I dreamed of exotic places such as the Himalayas, the Black Sea or the mighty Amazon basin. Technology has come a long way since the days I gazed at the pages of an encyclopaedia with my chin in my hands. Nowadays you can see the entire world in your hand through apps such as Google Maps. Other technological advances such as 3D printing have enabled maps to come to life from the pages beneath them. And so this is how I came to find the products of TerraForm . An Irish company that designs and manufactures 3D relief maps. One of which caught my eye -the beautiful Lakes of Killarney map – featuring Killarney National Park and the surrounding area. Appropriately, the Lakes of Killarney map arrived at Christmas time, so the little child inside me was a little bit excited when the package arrived. I chose the framed version of the map which comes fitted with a hook to the rear so it can go straight on the wall. The map covers Killarney town, the three Lakes of Killarney, the McGillycuddy Reeks, Killarney National Park and everything else in between. The legend and scale to the side are clear and accurate (if you want to get your pins and string out!). The Killarney map is a decorative map – so you won’t be tucking it under your arm for an ascent of Carrantuohil any time soon. The compact size of the map makes it ideal as a nice feature on a wall or mantlepiece. The 3D relief really brings to life the familiar landscapes such as the Gap of Dunloe and the journey of the three lakes past Glena and Tomies en route to Ross Castle and beyond. You can find out all the full details about the map by following this link. Make sure to check out some of the other cool maps of Kerry, Connemara and other parts of Ireland while you’re there. After I bought the Killarney map, I got in touch with Billy at TerraForm to tell him how much I loved it. 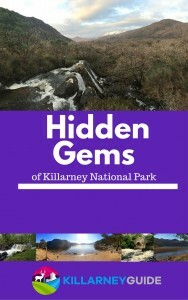 Billy was kind enough to offer a 10% discount to KillarneyGuide readers for any products ordered from terraform.ie. Simply used Use coupon code ‘KG10‘ after you add a product to your shopping cart to apply the discount. Thanks Billy! For anyone with an interest in Killarney or maps, you will love this product. For me, it embodies my love of maps, mountains and technology in one neat package – oh, and it also features Killarney as well so it’s the perfect match!